While on the hunt for some cute and comfy clothes for work, I stumbled upon the most wonderful skirt at Forever 21. 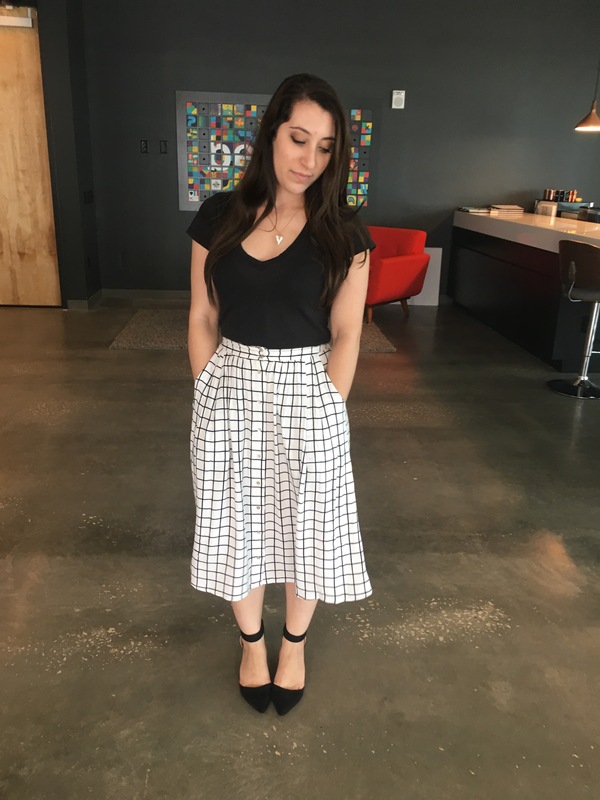 This Contemporary Grid Skirt was exactly what I was looking for! I adore midi skirts- not only are they adorable and chic, they’re incredibly comfortable and timeless. You will never not get compliments on an outfit like this. The only thing to be aware of is for those directionally challenged (shorties) like myself, make sure you’re wearing some heels to balance the longer length of the skirt. This adorable midi length skirt is perfect for work or dinner out. For work, I paired it with a black tee, a fun necklace, and some pointed-toe wedges. But, you can also rock it with a cropped top and booties. So versatile. Let me know how else you’d wear this adorable skirt!